If you have an iPhone 4, or a fourth generation iPod Touch then you might take an interest in Live Butterflies. 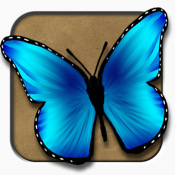 This app uses the camera and super imposes butterflies on the environment you are looking at. This is interesting, and for the first ten minutes captivated me. I also let my children try it, and they were into it about the same length of time. Family Friendly Gaming was provided a reviewable copy of Live Butterflies for this review. The app sells for ninety-nine cents so it won't break the bank. Unless your bank account is empty. There are two games in Live Butterflies. One lets you tap as many butterflies as you can in a specific amount of time, and the other one lets you look around and watch butterflies at your leisure. The butterflies look great in Live Butterflies, and there are a couple of different kinds. You can pick and choose which butterflies you want so that is nice. The camera in the iPhone/iPod Touch is okay. I hate to compare it to a stand alone camera, so I will compare it to my cell phone camera. My cell phone camera has better clarity. But then I did not get my iPod Touch for the camera. The music in Live Butterflies is pleasant, and fits the theme nicely. I did not notice flapping sounds which would have enhanced the music in my opinion. There are a lot of simple concepts on the iPhone/iPod Touch that have hours of replay value. For some reason I did not feel that way about Live Butterflies. I had others play this app, and the common comment was: "is that all there is?" What makes this section so difficult to rate is the very low price of the app. The game play in Live Butterflies is fantastic. Touching butterflies in the timed game works really well. My only complaint is there were not enough butterflies. The other issue was having to look all around me trying to find them. Dizziness could ensue. Touching the screen in the other mode to have a butterfly land on my finger was pretty cool. The problem is my hand blocked my view of the butterfly. I grappled and pray for quite a few hours trying to figure out any lessons in Live Butterflies. Maybe I am not intelligent enough, but I could not find any. Tapping butterflies to make them go away did not teach me anything other than speed. Watching butterflies super imposed on my environment taught me to appreciate the beauty around me. So I guess I did learn a few lessons from Live Butterflies. System Flaw is the first game Family Friendly Gaming reviewed that tried this concept. Live Butterflies is not the first game to use a camera, and add content to make a game. The idea is still interesting, but the innovation of it has worn off. That doesn't mean that this concept could be utilized in new and interesting ways. Live Butterflies is certain a different take on it, that captivated my imagination.